UFO SIGHTINGS DAILY: Glowing ring UFO recorded over New South Wales, UK on Nov 2018, Video, UFO Sighting News. 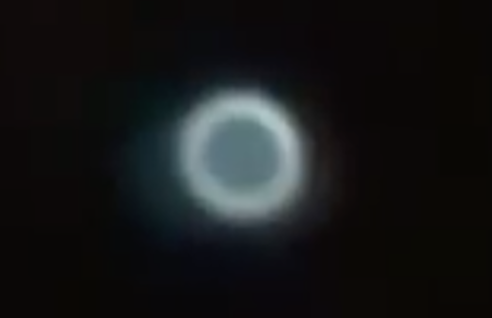 Glowing ring UFO recorded over New South Wales, UK on Nov 2018, Video, UFO Sighting News. Excellent capture of a very common shape UFO. A similar UFO was seen by thousand of tourists at Temple of Rock in Jerusalem back in 2011. Yes that one was real, and freaking amazing. The video was contributed by MUFON submitter 96385 and shows a round object with a white exterior and what appears to be a semi-transparent middle section. This gives the object a donut appearance. The video was originally about 6 minutes in length. The submitter describes what he saw: A bright white disc-shaped object with 4 white lights, one blue, one green, with multiple small beams of light. It is very difficult to see the different lights as the entire video seems to show only a white color.